The idea of the Object Pool pattern is similar to that of a real-life book library. Every one knows that it is cheaper to go to you library and borrow a book than to buy a copy for yourself. Likewise, it is cheaper (in regards to system memory and speed) for a process to borrow an object rather than to instantiate it. The Object Pool lets others "check out" objects from its pool, when those objects are no longer needed by their processes, they are returned to the pool in order to be reused. 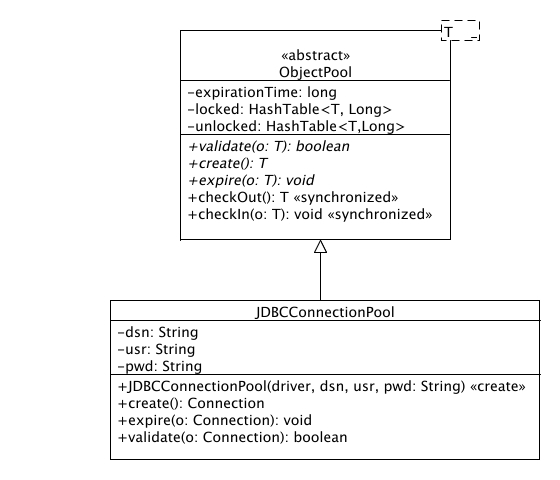 However, we don't want a process to have to wait for a particular object to be released, so the Object Pool also instantiates new objects as they are required, but must also implement a facility to clean up unused objects periodically. your application sporadically requires objects which are "expensive" to create. several parts of your application require the same objects at different times. Factory Method: The Factory Method pattern can be used to encapsulate the creation logic for objects. However, it does not manage them after their creation, the object pool pattern keeps track of the objects it creates. Singleton: Object Pools are usually implemented as Singletons. This Object Pool handles storage, tracking and expiration times. The instantiation, validation and destruction of specific object types must be handled by subclassing.